Share Your Voice; keep the conversation going. The stigma around mental health and its discussion often create barriers for those who could benefit from seeking help. Admitting to feeling stressed, anxious and depressed or to having thoughts of suicide can be the hardest first step. Being able to open up and share something you’ve been keeping to yourself for a long time can feel like a weight has been lifted. You might learn that the person you’re talking to has had some personal experience or knows someone in their family who has gone through something similar, which will help you to feel less alone. You don’t have to be an expert to talk and to listen, and often it’s the little things that make a big difference. The New Economics Foundation published the five ways to well-being. Share your voice and tell us what your five ways to well-being are and let’s advance a mentally healthy campus. Good2Talk is a toll-free post-secondary student mental health helpline created as part of the Ministry of Training, Colleges and Universities’ (MTCU) Mental Health Innovation Fund. Free, bilingual, confidential and anonymous, Good2Talk offers professional counselling, information and referrals for mental health, addictions and well-being to post-secondary students in Ontario. Student Counselling & Development (SCD) offers short-term individual, group and couples therapy for a wide range of concerns such as depression, anxiety, abuse, self-esteem, eating and body image, issues about sexuality and stress. Students seeking personal counselling are encouraged to contact us to make an appointment for an initial consultation which will be scheduled for the earliest available appointment time. The initial consultation is a brief interview during which our Intake Counsellor assesses the student's counselling needs. After the initial consultation, the student may be offered an appointment at SCD or an outside referral depending upon the nature of the issue and the availability of staff. At peak times during the year, students may have to wait a short while for an initial appointment or for further counselling. In the case of a life-threatening situation, students should call 911 or proceed to the nearest hospital. I n a non life-threatening crisis situation, same-day crisis-intervention services are available during our regular office hours. 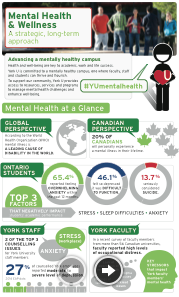 York University Psychology Clinic (YUPC) is a state-of-the art community mental health and training centre associated with the Department of Psychology in the Faculty of Health. The clinic provides a range of leading edge, effective mental health services to keep people of all ages living healthy, productive lives. Employee & Family Assistance Program (EFAP) is a confidential, short term, counselling service for employees with personal problems that affect their work. These problems, however, do not have to be caused by workplace issues. The EFAP is designed to help people understand or overcome their personal problems; a wide range of services are offered and they often refer to other professionals or agencies who can offer more or extended care in particular areas. You can get more information on the EFAP by visiting yu link.